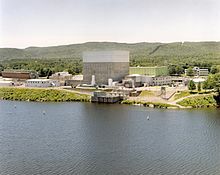 The Vermont Yankee Nuclear Power Plant discharges heated water to the Connecticut River. ↑ 1.0 1.1 1.2 1.3 1.4 দীপালী দাস (২য় সংস্কৰণ ২০১২). পৰিবেশ অধ্যয়ন. ISBN 81-85-916-100-4.